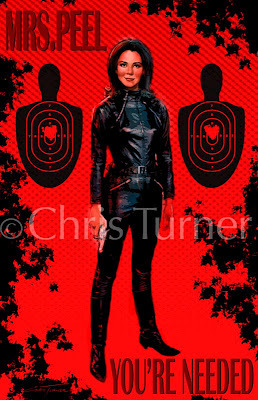 Artboy's Artblog: Emma Peel Returns! You've stumbled upon Chris Turner's Art-O-Rama and Den Of Shameless Self-Promotion! Click on the images to enlarge them All Images Copyright Chris Turner. Use by permission only. "Mrs. Peel, you're needed! "(or "We're needed") was how my favorite episodes of The Avengers TV show began. I wanted to do a new tribute piece with a better likeness than the one from a couple years ago. The pose is right from a production still, but how can you improve on Diana Rigg in a leather jumpsuit! A poster-y piece for fun. I've been in the commercial art world since 1982 specializing in storyboards and concept art for the entertainment and advertising industries.I currently work full time doing design for theme parks, and unfortunately I'm not allowed to show any of my day-to-day artwork. I enjoy swapping notes with others in the art field, please feel free to share your website or blog links.